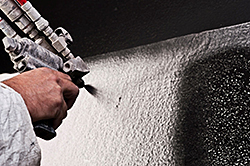 EonCoat provides fire, abrasion, chemical, temperature, and corrosion resistant protection in a single coat. It contains no VOCs, HAPs, formaldehyde or any solvent other than water, and is suitable for metal, concrete, wood, and other common substrates. It bonds through a chemical reaction with the substrate, making it virtually impossible for corrosion-promoters like oxygen and humidity to get behind the coating.